Your day could be going along as it normally does, or perhaps you are particularly rushed this morning, getting the kids off late for school, spilling your coffee or chasing down the dog. By the time you finally get out the front door you are completely harried and frenzied and it isn’t until you reach the car door that you realize that you do not have your keys. You trudge back to the house only to realize you have locked the door and there, through the window, you can see your car keys and house keys sitting on the table. Instead of feeling stressed, angry, or anxious, know that you can solve this problem quickly and easily with the assistance of a mobile locksmith. A mobile locksmith is perfectly suited to come to your rescue in situations just like this, making it important that you have easy access to a phone number to call them (you didn’t lock your cellphone in the house too, did you?). If there is a mobile locksmith in the area, they will be able to arrive on-site quickly, saving you hours of waiting outside hoping someone will show up to help you. Once on the scene, mobile locksmiths are equipped to handle the problem quickly and efficiently. A good mobile locksmith should arrive with the latest tools and technology as well as the experience and training to help you deal with any lock or key problem you’re having with your home or car. These locksmiths usually arrive in a marked vehicle and have all of the equipment necessary to open doors, replace locks, or provide replacement locks and keys so that you can get back to life as normal as quickly as possible. Before calling, it is important to let the locksmith know what kind of problem they are dealing with in order to be certain they have the capabilities to deal with advanced auto keys or exceptionally old door locks. The mobile locksmith should be able to remove keys, make replacement keys, repair locks, and take care of most of your other home or auto security needs. Mobile residential or auto locksmiths can be a godsend when you really need the help with all kinds of situations involving locks and keys. You can reach out to them with all kinds of issues that you may have, such as wanting more secure locks and home security systems installed in your home, getting new transponder keys for your car, replacing ignition locks and car door locks, or a variety of other tasks you need taken care of to be certain you have access to your property while keeping others out. When you have a quality licensed and experienced locksmith that you can count on to assist you with problems, you won’t ever have to feel stressed again about locking your keys in the car or forgetting your house key on the kitchen table. For the premier home and auto locksmith services in Stockton, Tracy, or Manteca, turn to The Key Guy Mobile Locksmith. The Key Guy Mobile Locksmith has years of experience assisting with all kinds of home and car locksmith situations, and they are able to arrive quickly and provide efficient and affordable solutions to your lock and key woes. Any vehicl e owner can tell you it’s pretty easy to lose your keys. Whether you find them stuck in a coat pocket or they disappear altogether, most car owners find that having an extra key is not just useful but essential. Twenty years ago, getting a spare key made wasn’t a big deal. It was easy to stroll into any hardware store or call a local locksmith and have one made in a matter of minutes. However, because keys at the time were so easy to copy, this also compromised the security of most vehicles. It was quite easy for opportunistic thieves to pick a lock in order to steal a vehicle. In response, the auto industry began creating more technologically advanced key systems that help make vehicles safer and more secure. While this has helped deter car thieves, it also means that replacing a key or getting a spare created is more difficult and more expensive for modern car owners. If you find yourself in a position where you need to replace or copy an auto key, you’ll want a basic knowledge of what goes into the process as well as how much you should expect to pay for the services. While parts and labor have different costs around the county, knowing ballpark figures should help you feel prepared when you contact your local locksmith for help. 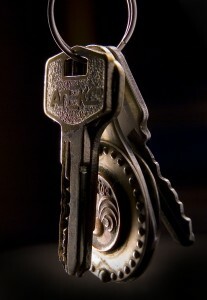 In the past, basic car keys used unique cuts and grooves along the blade of the key to provide security for vehicles. These kinds of keys were relatively easy to copy, and auto locksmiths did not need any specialized equipment to create copies of these keys. Basic keys can usually be obtained for less than $5 at a local car locksmith. While some car owners choose to go to the dealership for these kinds of keys, the only difference would be getting the automaker’s insignia along the head of the key. At the dealership, basic keys with branding can cost double, triple, or more what they would at an independent locksmith company. Modern vehicles usually have an electric remote key fob, also called a transmitter. These transmitters can be quite pricey to replace at the dealership, often running between $50 and $100, depending on the automaker and dealership location. Key fobs, unlike basic keys, need special programming to be functional. Unfortunately, many times dealerships will charge customers for 30 to 60 minutes of labor to program new key fobs, though oftentimes fobs can be programmed without dealership assistance. Many electronic key fobs can be reprogrammed with a unique pattern of button presses and ignition key turns. If you are uncertain how to program the key fob on your car, check the owner’s manual, or do a quick search online to obtain this information. As an alternative, you can always seek out an auto locksmith to provide key fob replacement and programming. Many times auto locksmiths are able to provide these services at lower rates than the dealerships themselves, although it is important to check the credentials of any locksmith you will have working with your property, as levels of expertise and results can vary. Transponder keys rose to popularity among auto manufacturers in the mid-1990s. Transponder chip keys increased security for vehicles by providing a more complex and sophisticated mechanism for locking, unlocking, and starting a car. A chip implanted in the plastic head of a key works with a receiver in the engine. The chip will send a signal to the receiver and if the signal does not match the one the receiver is programmed to be compatible with, the key holder will not be able to start the vehicle. While the blade of transponder keys can be either basic or laser-cut, the programmable chip is what elevates transponder chip keys to a whole new level of vehicle security. Naturally, all dealerships should have the equipment necessary to create and reprogram transponder chip keys, although some may charge steeper prices than others. Many – though not all – auto locksmiths also have the equipment necessary to provide replacement transponder chip keys as well and they are often able to charge lower rates than dealerships. For some vehicles, transponder keys and key fobs are a single unit, which can make the cost of replacement even steeper; some car owners can expect to pay over $200 for a transponder key/fob unit at a dealership. Going to a reputable locksmith can knock up to $30 off this price. There are ways to cut costs when dealing with transponder chip keys, such as planning ahead. One preventative measure you can take is having a basic key cut without a transmitter. This key will help in cases where you simply need access to your vehicle without actually having to start the engine, such as accidentally locking your keys in your car. Additionally, you can program a third key to keep as a spare. Many car manufacturers will allow car owners to program a third key on their own, saving costly labor fees at the dealership. Alternatively, you can outsource this task to an auto locksmith rather easily by having them do the entire thing, or by having the key cut and programming it yourself. Simply browsing your owner’s manual or doing a search on how to program a key for your make and model of vehicle can yield simple, step-by-step instructions that you can try to follow yourself. Many domestic vehicles allow new keys to be programmed rather easily with the existence of two pre-programmed keys. Simply insert a working key into the ignition, turn the key into the “on” position for a minimum of three seconds, and repeat with the second key and the new third key. However, this is not guaranteed to work for all makes and models of vehicles and it is best to do research and check with the manufacturer before investing an excessive amount of time and money into this approach. Stay tuned to learn about more different kinds of modern keys and how to replace them.